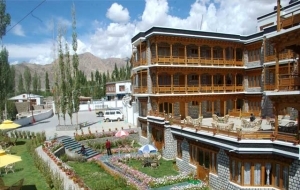 The grand Dragon is the top class hotel in Ladakh located just 15 min walking distant from leh old market. 50 beautifully appointed rooms that including 2 royal suite, 1 executive suite and 3 Dragon deluxe rooms. 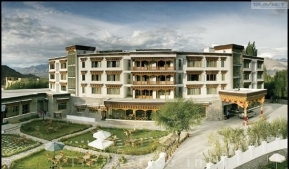 Druk Ladakh, One of the finest hotels in ladakh to make you experience world class accommodation and services.Hotel Druk Ladakh makes you breathe the freshest air in the Leh,which is nestle in the lush green fields of barley and poplar trees, the sound of the streams often send you meditative mood and still making it accessible to shop in the city market. 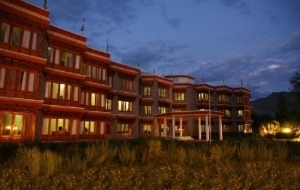 Hotel druk have 3 suit and 23 deluxe rooms. Hotel shangrila stands on the outskirt of the city is the combination of modern facilities with traditional architecture. Just 5 k.m. away from the airport and 10 minutes of walking distance from the main market. 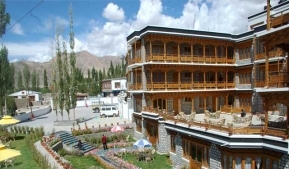 Hotel Shangrila is surrounded with amazing beautiful mountain range which provides you complete privacy and tranquil atmosphere for relaxation. 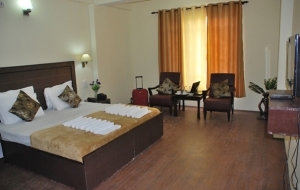 total 15 super deluxe rooms and 20 deluxe rooms. ·Multi - Cuisine Restaurant with separate vegetarian Kitchen. 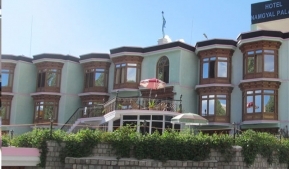 The Hotel Namgyal Palace is an ideal retreat in one of the most breathtaking places in the world. Relax and unwind yourself amidst tranquil abundance that will rejuvenate your mind and body and give you a new zest in life. 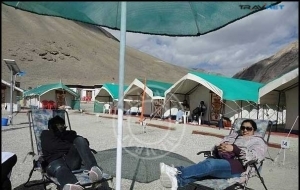 Located in the heart of Leh. 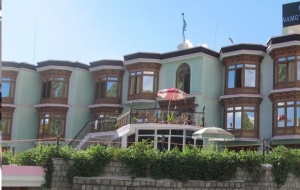 Hotel Namgyal Palace is an ideal place to spend your holidays, the most I like about the hotel is all the rooms are front face where you see beautiful mountain of Zansker rage. The Hotel combines the contemporary design with classical standards of service and excellence so that you get the pleasure of living in impeccable surroundings. · 15 rooms are centrally headed out of 28 rooms. · Multi - Cuisine Restaurant with separate vegetarian Kitchen. 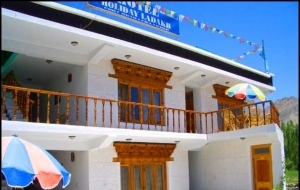 Hotel Holiday Ladakh is situated in a quiet side-road of Fort Road, at a walking-distance of about 10 - 15 minutes to the central Main Market. The traditional Ladakhi architecture, complimented by a terrace-lawn and marble-paved, wide terraces in front of the guest rooms. From there you can enjoy the marvelous view over the Indus-Valley to the bright glaciers. Trip adviser had rewarded for the superb services in 2012. 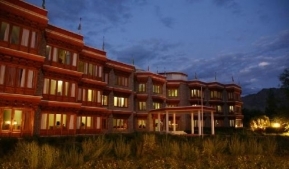 It is our pleasure to introduce a new hotel "Zojila Residency", rooms are comfortabel and contemporarity designed, with exceptional views of the mighty Suru river. 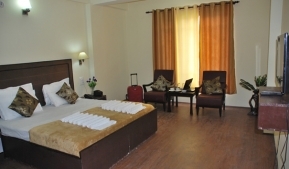 hotel own have total 34 rooms included 2 family suites and 32 deluxe rooms. the hotel's recreational facilities, including garden. A welcoming atmosaphere and excellent service are what you can expect during your stay. Outdoor dinning on the bank of River Suru. Multi- Cuisine Restaurant with separate vegetrian kitchen. Internet facility on demand with extra charges. 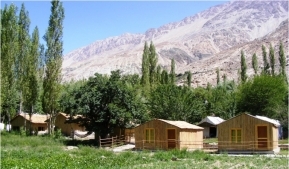 Nobra organic Retreat, built on the theme of organic farming to reflect the true spirit of Ladakh. Started by retired school teacher and his wife late Mrs.Tsering Dolma , who was a famous farmer of the region and also a recipient of many awards including national award for innovation in subsistence based agriculture. Set amidst majestic forests of poplars, willows trees, magnificent walnut, fruit-bearing apple trees, organic vegetable garden, chirping birds all around, refreshing mountain air, gurgling glacier streams, the impeccable lodging, dining and bonfire. Nobra Organic Retreat offers the best possible for all those longing to spent precious moments in the lap of nature , for all those deserving a romantic gateway amidst nature, or to break free from the hustle and bustle of habitual life. Multi – Cuisine Restaurant with separate vegetarian Kitchen. 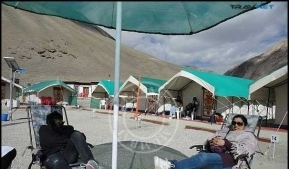 Martsemik Camping Resortis luxury tented camp at Pangong Lake offering unparallel views of the surrounding mountain ranges and a wonderful view of Pangong lake. Set amidst quite and peaceful environment on top of the world. 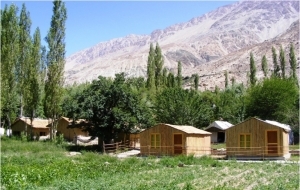 The camp is managed with a simple goal to take sensitive approach of tourism. 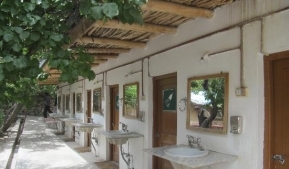 The tented accommodation is well appointed with all the modern facilities with private specious bathrooms running hot and cold water and private verandah that is ideal place to enjoy the timeout a middle of day. ·30 luxury tents with attached bath room. 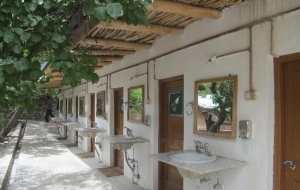 · 06 rooms with common bathroom. · 24 hour running hot and cold water. · Luxury dinning room with separate coffee shop.